By Meraj Hoda, vice president, business development at Ring. In addition to doors and windows, your garage is one of the most vulnerable areas of your home. Most garage doors are electronically controlled by universal remotes, and a burglar can easily open these types of garage doors with their own modified remote. Burglars will also look for garage-door openers in cars, smash the windows and use the remote to gain access. On top of that, many garage doors also have an emergency release lever, which can be unlocked in just a few seconds by a savvy thief. To protect your property, never leave your garage door opener in plain sight, and always secure your garage with a heavy-duty padlock or an automated garage door lock, which will automatically lock your garage as soon as it closes. A burglar wants to get in and out of your house as quickly and covertly as possible. Because of this, a home with a dark front or back yard will be their preferred target. Make sure there are no blind spots on the outside of your home. Get a light for your front porch that stays on all night, and place motion-activated floodlights around your property. Ring recently launched the new Floodlight Cam, an HD security camera with built-in floodlights, a siren alarm and two-way audio. Floodlight Cam streams 1080p video and comes with two 3K lumens LED floodlights, and it starts recording and turns on the lights as soon as it detects motion. Thick shrubbery and tall plants are great ways to provide some extra privacy for you and your home. Unfortunately, they also provide great hiding spots for burglars lurking in your yard. If your entire front yard is visible from the street, a burglar will most likely think twice before trying to break-in. If it’s possible, be sure to keep the plants in your yard trimmed, and use accent lights and floodlights to expose dark areas. If you live in a home with multiple stories, make sure the windows on the upper floors are always locked, and store your ladder in a locked garage or tool shed. Leaving a ladder in your yard makes it easy for burglars to access your upper floors. And if it’s during the day, most neighbours would simply think that a contractor is working on your home and never consider it suspicious. 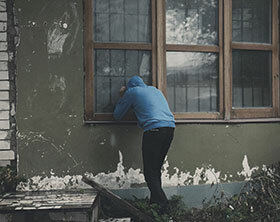 One of the most effective ways to prevent a burglary is by making it seem like you’re at home – even when you’re away. For example, with Ring Video Doorbell, you can answer the door from anywhere, and see, hear and speak to anyone at your door from your smartphone. By answering the door in real time, you can send the illusion that you’re at home, no matter where you are. You should never be too trustworthy of your ‘friends’ on social media. There are countless horror stories of people announcing their plans online and getting robbed by people in their social networks, so you should always err on the side of caution. Wait until you return from your trip or event before talking about it on social media, and if you absolutely need to share your plans, do it with a private group of people you can trust. Instead of a traditional alarm system, which can be quite expensive, you can create your own DIY security system that’s easy to install and maintain on your own. For example, with a Home Security Kit from Ring, you can get a video doorbell for your door and Stick Up Cams for around the house, and you can monitor your entire property from one simple dashboard in the free Ring app. Unfortunately, most traditional security systems are reactive solutions that don’t really prevent crime. In other words, most traditional alarms will let you know when a burglary occurred, but there is little that you can do to actually stop the crime from taking place. With smart, Wi-Fi connected security devices, you’ll always have home security at your fingertips, and you can respond to and prevent suspicious activity as it happens. Making use of big data, home security systems are now able to analyse camera streams and proactively alert armed response service providers.